The grave marker at night. The green patches were the spots that luminesced after being exposed to a strong light. I first heard the story from Joe Howard, a local ghost hunter, during a talk he gave at the Marion Public Library in 2007. 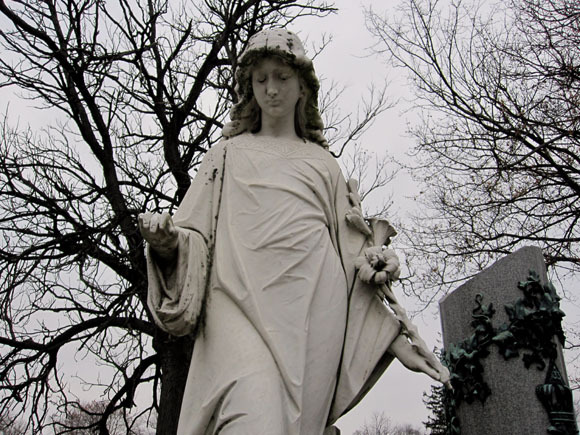 The story goes that the angel standing atop this particular Marion grave has glowing eyes. Here’s the kicker: the eyes really do glow at night! Seth and I saw it for ourselves. The story Joe told was actually a story he had heard from a local police officer. The story, as best as I can remember it, went something like this: officers who knew about the strange characteristics of the angel would prank unsuspecting rookies by driving up to the monument at night and finding an excuse to have to rookie approach the statue. When the unsuspecting rookie got within a few feet of the statue (which was now brightly illuminated by the patrol car headlights), the officer in the car would suddenly turn off the headlights, leaving the rookie to face a statue with glowing green eyes. It’s a good story, and actually pretty funny, but I had my doubts about it. Police officers pranking rookies? Maybe. But a statue with glowing eyes? That’s a little tougher to believe. But then Joe said something that changed my mind. Even without the glowing eyes, this is one of the more striking grave markers in the Marion Cemetery. And the eyes are glowing! It’s a dull, greenish glow. And while we both know there’s a scientific explanation for what we’re witnessing, it’s still singularly unnerving. Update! In April of 2014, I received an interesting e-mail about the statue from former Marion resident Ron F., and I think it’s worth sharing. After I graduated from Harding and before joining the Navy in 1985, I used to go with a friend of mine, Jerry (not his real name), to a pick-up game of tackle football that was held at the back of the Harding Memorial. If I remember correctly, it took place on Sunday nights at midnight. Surprisingly, a lot of Marionites would show up for this game, and we would play for a few hours into Monday morning. After the games Jerry and I would take a shortcut through the Marion Cemetery and then jump the fence at the old Harding High School (now Grant Middle School) on the way to my home on Franklin St. On those nights, as we walked across the cemetery, we would talk about the mysteries the cemetery held. Jerry was known for his good stories and told me about a statue that shed tears. He said that no one could explain how it happened. Knowing that Jerry could tell an excellent story, I was skeptical but also curious. When I asked him if he knew where this “crying” statue was, he said he thought that he knew the area of the cemetery where it was located but not where it was specifically. We looked around that night for it but didn’t have flashlights with us, and so we weren’t able to find it. The next football game, I decided to bring a flashlight with me so that I would be ready for our return trip. After the game, we took our normal detour thought the cemetery, and we looked for the statue. We found it, and it did look as if “she” was crying, but it was just moss growing from the eyes and down the cheeks of the statue. It was not wet, and nothing seemed that odd or mysterious about her. After inspecting the statue, we started walking away, Jerry in the front. When he turned toward me to say something, he froze. I look at him and asked what was wrong, and at first Jerry not able to form a word. He just stuttered before blurting out, “Her… her eyes!” I didn’t understand what he was talking about but realized that he was staring behind me, so I turned to look. I froze instantly when I saw her eyes glowing back at us. Jerry collected his wits and started to run, yelling at me “Let’s get the hell out of here!” For a second I coulnd’t move – I had visions of arms reaching out of the ground, grabbing me, and dragging me into a shallow, earthy grave. I have never been that scared in my life. I quickly regained my wits, however, and ran after my friend. When we reached the fence at the boundary of the cemetery and the high school, we paused. I asked him what in the world had just happened. He looked at me blankly at first, but after talking about it for a while, we realized that someone must have applied photo-luminescent (glow in the dark) paint to the eyes of the statue. 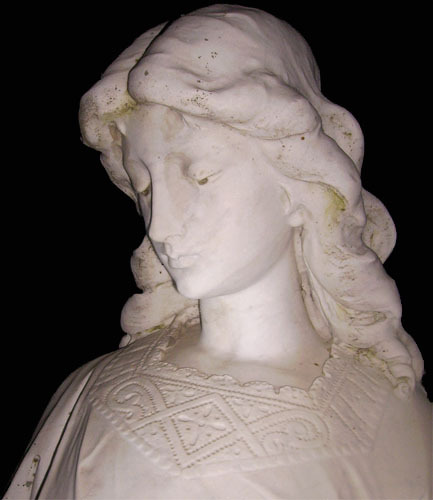 Curious, we retraced our steps back to the statue, and as we approached we could see that the eyes were still glowing. I looked up close and could see the lines left in the paint from the brush strokes. Earlier, as I had examined the statue with my flash light, I had unwittingly charged the paint so that it would glow. As we continued to my house, we had a good laugh and wondered who would have done something as crazy as that. After that night, Jerry and I told the story to our friends and family, and the next thing I knew everyone was going at night to see this statue. Shortly after I left Marion to join the Navy, I heard that it got so bad that the cops were patrolling the cemetery at night and chasing people away, so apparently the police knew about it too. As far as I know (though I’m by no means sure), at that time there were no city ordinances against being in the Marion Cemetery at night. But then things got bad enough that the city passed an ordinance stipulating that no one was allowed in the cemetery after certain time. Someone put the paint on the statue’s eyes, and I assume the purpose was to scare other people, so I’m sure some folks around town must have known about it before our discovery. But up until that time, I don’t think it was widely known. I’ll be happy to give you a much better picture of this marker. Also – this is the reason behind so many stories of “glowing” headstones in cemeteries. White marble is prone to a phosphorescent microscopic lichen. I’ll see you on the 17th at the Marion Historical Society. I have many of the backstories on cemeteries of Marion County. You guys are sooo stupid. I know who made her eyes glow. Well? Are you gonna tell us, Mariah?